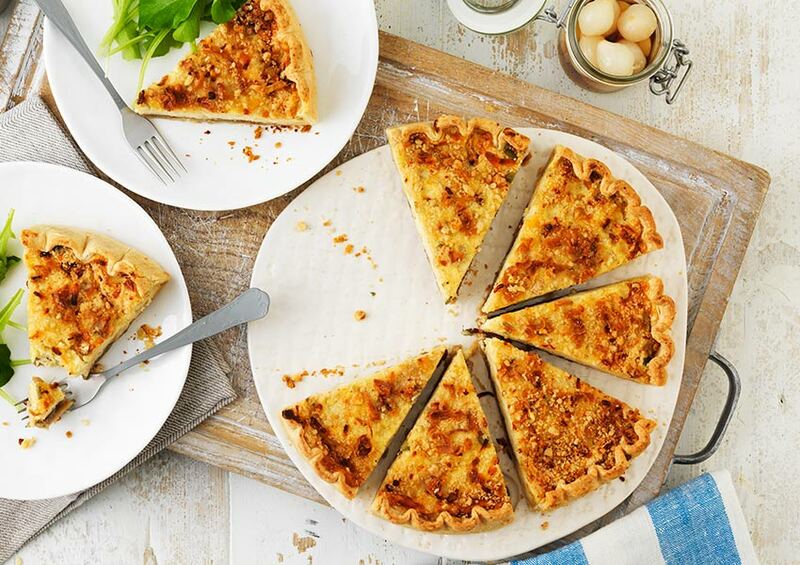 8 slices of moreish cheese and onion quiche with a layer of pickle, topped with crispy onion sprinkles. Cows' Milk (18%), Onion (17%), Free Range Egg (15%), Fortified British Wheat Flour (Wheat Flour, Calcium Carbonate, Iron, Niacin, Thiamin), Cheddar Cheese (Cows' Milk) (11%), Butter (Cows' Milk), Water, Onions (2.5%), Sugar, Rapeseed Oil, Wheat Flour, Cornflour, Medium Fat Hard Cheese (Cows' Milk), Salt, Dates, Apples, Spirit Vinegar, Palm Oil, Yeast, Acetic Acid, Sea Salt, Black Pepper, Pectin, Caramel, Cayenne Pepper, Mustard Powder, Ginger, Chilli. All butter short crust pastry deep filled with a layer of ploughmans pickle covered with a creamy free range egg custard with Mature cheddar cheese and onion. Hand finished with a Cheddar crumb and crispy onions.